As sugar prices rose after the second World War, increased expenses and competition primarily from Coca Cola made the Moxie empire dwindle. Moxieland closed, and the company later continued from it's Needham Heights, MA location until the late 60's. Today, it remains as it began, a "New England" beverage, under the ownership of the Monarch Corp. in Atlanta, GA.
Moxie is still made here in New England by a few bottlers, and can be found in most local supermarkets. If you don't see it, ask for it! Moxie was quite popular in coastal seashore resorts, and had strong ties to the "good times" of our Nation as it emerged as a world industrial leader. The heyday of Moxie started around the turn of the century. This is why most of the postcards in the list depicting "When America Had a Lot of Moxie" are Main Street scenes, and Amusement Park scenes associated with northeastern coastal locations. This list is the most comprehensive of Moxie postcards out here for collectors. If you know of more, please write, and we will update it. 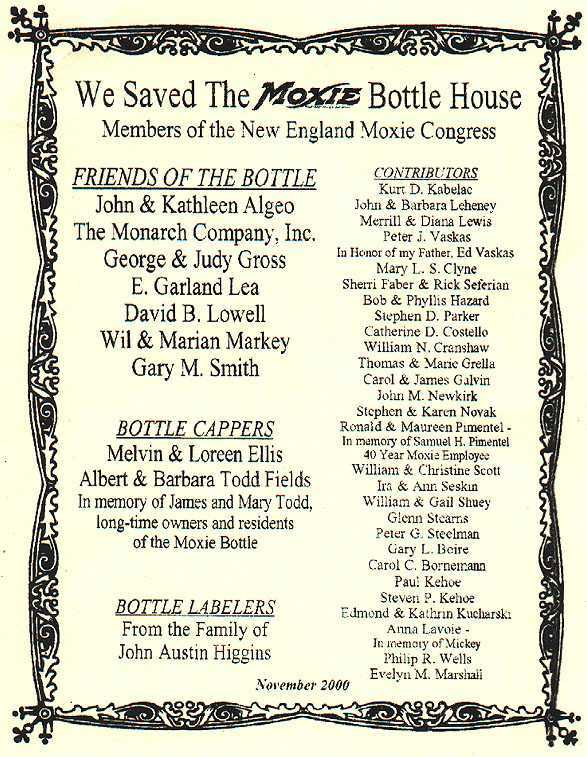 The largest (read that..."only") organization dedicated to Moxie is The New England Moxie Congress. 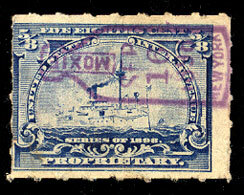 The "Congress" is a group of enthusiastic collectors of Moxie Memorabilia including Moxie advertising, company related documents, photos and postcards. The group also has amongst it's membership historians who are dedicated to keeping Moxie alive for it's part in American history. Membership is $10.00 per year, and includes a newsletter which has updates on Moxie events, auctions, and information on collector gatherings. Become a life member for only $100!! The annual Lisbon Falls, ME., "Moxie Days" celebration is held the second Saturday in July. The� 3 days of festivities include an hour long Parade, traders and swap tables, town barbecue and lots of Moxie. The Festival recently has drawn national attention to this once local event. Frank Anicetti, owner of the Kennebec's Fruit Store/House of Moxie is the main force behind this event. The following day, is the Annual Meeting of the New England Moxie Congress. This takes place at the Seashore Trolly Museum (the largest collection of old "restored" trolly's in the World, and a great place to visit anytime) in Kennebunkport, ME. "Congress" members get free admission to the museum for this event. Through the efforts of a few dozen members of the New England Moxie Congress, as well as Cornicopia Bottling, the Maine State Historical Commission and the Matthews Museum in Union, Maine, we have purchased and stabilized the last remaining Moxie Bottle kiosk . The 2 story structure built as a giant replica of Moxie Bottle once graced and served Moxie at long gone New Hampshire amusement park. Recently purchased, it was disassembled, and will be restored to its former Glory at the museum in Union. The Matthews Museum ( a 501-C-3 non profit Corp) is seeking dontations large and small, and Corporate Sponsors. ALL dontaions greatly accepted and appreciated . This money will go to build a structure around the bottle house to Preserve and display it. This is the "Official" list " of all those who have so far made the Save the Bottle House" project a success. The Moxie Congress is working with the Mattews Museum in the restoration of the Moxie Bottle Kiosk. We are pleased to offer this great deal to Moxie Enthusiasts interested in restoring and displaying the last remaining Moxie Bottle stand.Click on the Bottle Stamp below for more information. Frank Anicetti has a catalog of Moxie items he sells from his store, shipping worldwide. Frank also makes the finest (and probably only) Moxie Ice Cream, and Moxie Ice Cream Floats. If you need a supply of Moxie , or one of the many Moxie collectables, Frank's business number is 207-353-8173 . A Florida buisness also ships Moxie. Subs-N-Such - Home of Sodamania in Tampa Florida ships Moxie out all over the Country. They accept Visa /Mc. Phone number is 1-813-972-1784. Here is a link to the Moxieworld web site and their list of Moxie distributers, and everything else Moxie. For a complete and quite detailed history of Moxie, read The Moxie Encyclopedia by Q. David Bowers (Vestal Press Ltd., ISBN: 0911572-43-0). The Book of Moxie by Frank Potter is a good guide for collectors and dealers, with hundreds of color pictures available of Moxie items (Collector Books, a division of Schroeder Publishing Co., ISBN: 089145-348-2). Moxie continues to live on in the hearts, souls, and taste buds of stalwart New Englanders! Try some!! You too can "Learn to Love Moxie "